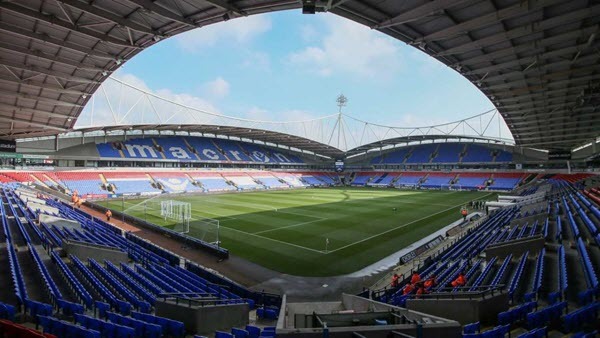 Built as the Reebok Stadium between 1996 and 1997, the Macron as it is now known is home to Bolton Wanderers and replaced the Trotters’ old home of Burnden Park. Rather disappointingly, the first Premier League game here between Bolton and Everton in September ’97 ended in a 0-0 draw. The modern design makes it an aesthetically pleasing stadium and it can even boast a hotel as part of the overall complex. As became the way with football clubs in the 90’s and 2000’s, Bolton moved to a new arena in what is essentially an out of town retail area, devoid of much character and fully five miles from the centre of Bolton. The pitch at the Macron measures almost 101 metres by 66 metres, rather on the small side despite it being within a very modern stadium. The surface is a mixture of synthetic fibres and natural grass while a modern undersoil heating system is utilised to ensure games are not missed due to frozen pitches. The current capacity of the Macron Stadium for football matches is 28,700, though the largest crowds seen here have tended to be for music concerts where around 40,000 are permitted entry. Simply; the Macron is made up of the North, South, East and West Stands. All of the corners are filled in at the lower level however and the overall construction is that of a bowl, looking like a perfect circle from the outside in fact. Visiting fans at the Macron Stadium usually sit in the South Stand; a two-tier stand offering up to 6,000 seats should demand be high enough and home support not sufficient to warrant a lower allocation. The general allocation though is 3,000 with the stand being shared with home fans. The bowl-like structure does lend itself to swirling noise and it’s something not missed by fans housed usually in the upper tier of the away end. The general feedback is decent although it’s a shame the stadium is planted so far away from a town centre. Single adult matchday tickets at the Macron for a Championship fixture range from £15 for D Grade fixtures all around the ground, up to £30/£32/£35 for A Grade games depending where you choose to sit. Family tickets are available for as little as £20 while under-12’s can get in for just £7 each and every time. Prices are available direct from the club for seating in the Lion of Vienna, Hall of Fame, Platinum Suite or the Executive Boxes. All areas offer unrivalled views of the action, comfortable seating and terrific choice of food and drink as well as other matchday perks. Given the move to this soulless area, the stadium is unfortunately around five miles from the middle of Bolton. Trains to Horwich Parkway then are the best way to get there as the station lies only a couple of minutes walk away. Trains to here are regular from Blackpool, Bolton, Manchester and Preston. The stadium sits very close to the M61 motorway. Simply leave the motorway at junction 6 and the stadium is visible straight away. Given that the Reebok Stadium, as it was then, was built to host Premier League football and did for a while, there are no current plans to modernise, redevelop or extend the Macron given that the club are playing at a lower level and the demand does not exist. The Madejski Stadium, built in 1998, replaced Elm Park as Reading’s home ground and has been the home of the Royals ever since. As well as Reading FC, the stadium also plays host to rugby union side London Irish though this may change if and when Brentford can build their new stadium. The name of the stadium comes from Reading’s chairman Sir John Madejski who oversaw the move and the West Stand of the stadium contains the Millennium Madejski Hotel. The ground is rather unfortunately built on the site of a former waste dump and is surrounded by methane vents, something which does not help the overall feeling the stadium being without much atmosphere as a football venue. The pitch at Reading is dot-on in terms of standard professional size; 105 metres by 68 metres. It is made up of a mixture of grass and fibres and is of 3G standard meaning it suffers little from wear and tear or bad weather. To compliment this, the ground employs undersoil heating to ensure the pitch does not freeze. At 24,100 the capacity at the Madejski is plenty to supply the demand for tickets at Reading home matches. The Madejski is basically an oblong structure with its curved corners joining together the North, South, East and West Stands. The West Stand is the one housing the dressing rooms and tunnel and is the only one to feature two tiers. 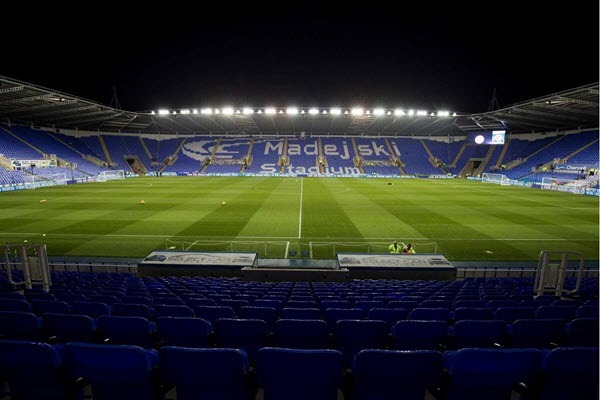 Away fans at Reading tend to be housed in the South Stand of the Madejski Stadium behind the goal. The standard away allocation for the Championship is 2,100 though for cup games or those with a particularly high demand from visiting supporters this can be increased to 4,300, taking up the whole of the middle block with only the corners of the stand housing home support. The South Stand is just a single tier and therefore lends itself fairly well to noise but, as a modern structure with a fairly lifeless design, is a lot like Bolton in that it seems to have been picked up and placed in a location not really lending itself to vociferous football supporters, though the kiosks inside the ground give plenty of options for food and drink. Adult matchday prices for a single seat tend to range from £25 to £35 at the Madejski, with 65’s and over gaining access from as little as £16 and under-17’s from £8. VIP Boxes, the Royal Suite and the Premier Suite all have inviting interiors, welcoming guests who wish to watch the games in style. Boxes are from £1,400 per game plus VAT for 10 guests, while the other suites range from £85 to £150 per person, per game plus tax. The stadium sits around 2½ miles away from Reading train station and the town centre to the south, about a 25-minute walk away. 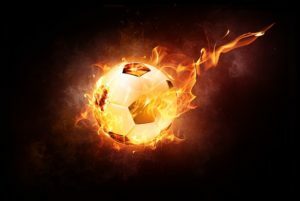 Trains connect to Reading from London Paddington, a half hour journey, plus on matchdays specially chartered football buses run between Reading train station and the Madejski. 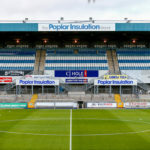 Although a £500million development of homes and amenities around the stadium is planned, nothing as of yet in terms of redevelopment is planned for the stadium itself. 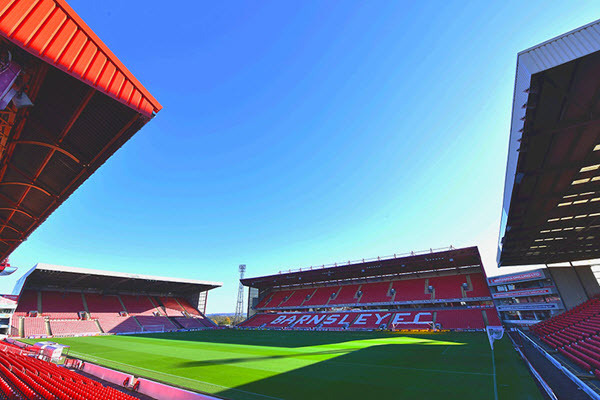 Oakwell Stadium is essentially a multi-purpose sports facility in Barnsley, home most famously to Barnsley FC. 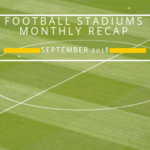 The overall facility comprises the main football ground as well as Barnsley’s academy, an indoor training pitch, a mini stadium (2,200 capacity) and several outdoor training pitches for Barnsley’s senior, reserve and junior teams. Although Oakwell’s main stadium is more or less solely the domain of the Tykes these days, in the past the pitch was used for Wakefield Trinity Wildcats’ rugby league games in the Super League in 1998. Wakefield and Emley FC used the ground for an FA Cup tie the same year and even Manchester City have used it for a UEFA Cup match in 2008 due to an unsuitable pitch. 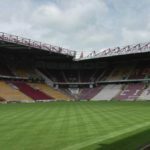 Barnsley maintain a fully natural grass pitch helped partly by lots of natural sunlight getting into the ground and the fact that undersoil heating is also used when needed. The heating also prevents the loss of fixtures due to frozen pitches. The playing surface is measured at 100 metres by 68 metres. That makes the pitch a regular width but an ever so slightly shorter length than most top level teams. The current capacity at Oakwell since the ground had to go all-seated is just shy of 23,300 though the corners could be filled if the need ever arose. Running the length of the field are the West Stand (lower and upper tiers) and the East Stand lower and upper. Behind the goals are the North Stand and the South Stand. Only one of the grounds corners has any seating, with the Dimensions Corner Stand a small structure sitting between the South and East Stands. Visiting supporters at Barnsley are traditionally housed in the North Stand, a newer structure and one which can hold 2,000 away fans on a typical allocation mixed with home support though for higher demand all 6,000 seats can be used by away fans. There are absolutely no problems with the view at Oakwell with no lo roofs or support beams in the way and the away section more or less split into two tiers. Matchday ticket prices for a single adult at Oakwell are as follows; £38 (Category A*), £32 (Category A), £30 (Category B), £27 (Category C), £25 (Category D). 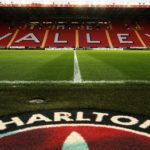 Tickets are heavily discounted for over-65’s and under-22’s while those under 12 can attend any Barnsley home match for £7. Seasonal packages are available at Oakwell from £700 per person plus VAT with match-by-match packages available by contacting the club. A typical hospitality day at Barnsley includes a programme and teamsheet, executive seating, premium views, pre-match lounge, licensed betting, bar, interviews with the man of the match and priority booking for other Barnsley home tickets. Barnsley’s home of Oakwell is situated east of the town centre, not far from the main train station just a 5-10 minute walk away. The station is served by direct trains from Huddersfield, Leeds and Sheffield. Bus routes serve the area from all around Barnsley while drivers heading to the stadium should come via the M1 motorway, leaving at junction 37 for Barnsley. Take the A628 towards the town centre before following signs for Oakwell or Football Traffic. At present there are no firm plans on the table for Barnsley to redevelop, extend or significantly modernise Oakwell for the time being. Portman Road has been the home of Ipswich Town since 1884 and it is a structure which still maintains most of its old charm. 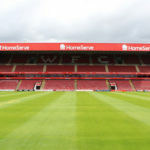 It underwent considerable redevelopment in the early part of the millennium and increased capacity from 22,000 to 30,000, beating rivals Norwich as the biggest stadium in East Anglia. The Tractor Boys, as they are now affectionately known, played their earliest games at Broomhill Park but moved to Portman Road in 1884 when the ground was also used as a cricket venue. The East Suffolk Cricket Club had played on the site since 1855. Following the death of club hero and former manager Bobby Robson in 2009, the club announced that the North Stand would be renamed as the Sir Bobby Robson Stand. Fittingly, the unveiling took place at half-time during a game against the club with which Sir Bobby is synonymous – Newcastle United. Undersoil heating is an expense that Ipswich Town have wrestled with for a long time, so far it seems that the scheme has seemed too cost prohibitive. The pitch is all natural grass and the playing area measures a standard-to-short 102 metres by a wider than normal 75 metres. 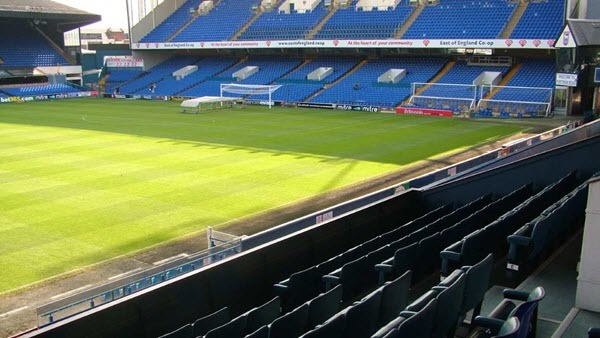 Currently just over 30,300 people can occupy Portman Road for home league fixtures. Portman Road’s makeup is, clockwise from the north; the Sir Bobby Robson Stand, the Cobbold Stand, the Sir Alf Ramsey Stand and the East of England Co-Operative Stand. As an old-style stadium, the corners are not filled in at Portman Road though the atmosphere and the noise do not suffer. Opposition supporters visiting Portman Road are housed in the Cobbold Stand, an old structure which runs the length of the field on the eastern side. Away fans tend to be on the second tier of the stand with an allocation of 1,900. The main gripe or away fans surrounds the fact that, as an ageing stand, the structure was clearly nor meant for seating in most places and thus it tends to be cramped and uncomfortable. The noise however which is generated makes for a good atmosphere and the amenities by all accounts are decent. Rather than categorising matches as other clubs do, Ipswich keep the same pricing structure for home fans in all Championship games at Portman Road. Adult single prices for the lower tiers are £25, goal end upper tiers and side stand wings are £30, side stand central tickets are £35 and premium seating is £40, £43 and £52. Concessions are offered for over-65’s, under-23’s and under-19’s as well as special pricing for the disabled. Ipswich Town offer a range of hospitality options at Portman Road easily seasonally or on a match-by match basis. Guests are welcomed into Robson Hospitality, Premier Hospitality, Suites, Cobbold Boxes or the 1878 Club. Prices are by enquiry only though the club has a dedicated sales and hospitality team who will reply quickly and discuss options with you. Very handily situated right in the middle of Ipswich, Portman Road is only a 5-minute walk from the town centre and the main railway station. Buses serve the area too, while driving could not be simpler; follow directions to Ipswich Town Centre from any direction and as directed above, any car park will be a very short walk from Portman Road. 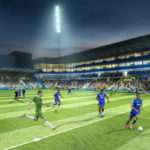 Partly due to the club’s extended stay outside of the Premier League, Ipswich Town currently have no immediate plans to redevelop, extend or massively modernise Portman Road. 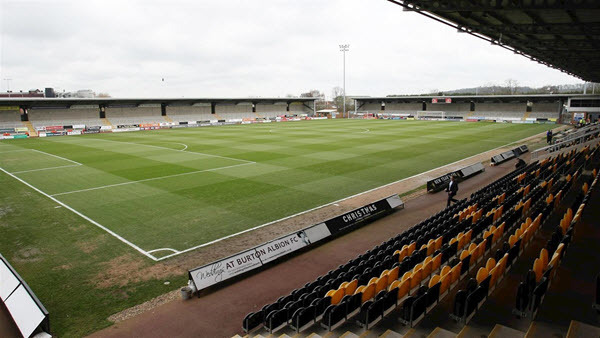 Burton Albion, having previously played at Eton Park, have played their football at the Pirelli Stadium since it was built in 2005 at a cost of £7.2million. The names come from the fact that tyre firm Pirelli donated the land to the club in return for naming rights. The Brewers’ pitch measures an understandably tight 100 metres by 66 metres and is made up only of natural grass with no synthetic fibres woven in. Just 6,900 can squeeze into the Pirelli Stadium for home league matches and not all of them seated. In fact, only 2,000 of the allowed spectators are afforded a seat. The Pirelli Stadium is made up of its four individual stand structures, namely the North, South, East and West Stands. The stands are sponsored these days but are known by their original names by fans with the East and West stands behind each goal and the North and South running the length of the pitch. Visiting supporters at Burton cannot expect a huge allocation based on the size of the stadium, though a fair bunch of 1,400 tickets are usually offered up with an additional 400 available in a different area. The main away bunch is housed in the East Stand behind the goal while the rest can sit in the all-seater Main Stand with home fans. Given the penchant for most football away fans to visit what they call “proper” football grounds, the feedback from Championship fans has been good at Burton as they feel close to the action all the time and can hear as well as see what is going on in the game itself. Nothing is complicated at Burton, much to the delight of most supporters, and the ticketing policy is no different. The games are not tiered or categorised according to time of year or the level of opposition, meaning each age group has two choices; seated prices or terraced prices. Adults pay £24 to be seated and £20 on the terrace, over-65’s pay £22 or £18, 17-22 year olds £22 or £15 while under-17’s just £14 or £7. There are just two main options for hospitality guests at the bijoux Pirelli Stadium; the Albion Suite or the Executive Box. The suite is modern, spacious and offers a private bar and the best views in the stadium. The Executive Box has all of the above with extra perks such as a four-course meal and your own comfortable seats directly outside the box. Interested parties should contact the club directly to find out match-by-match prices. Drivers going to the Pirelli Stadium should head towards Burton on the A38 before turning off onto the A5121. The stadium is right near the road and will be visible very quickly. The nearest train station to the stadium is the main Burton-on-Trent station but this is over 1¼ miles away and will take 25 minutes or more to walk. Local buses serve the area from the centre of Burton too. Although tentative plans existed, Burton Albion announced in 2016 that there would be no extension or major redevelopment of the Pirelli Stadium in the near future. 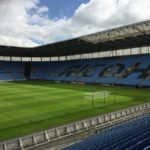 Even after reaching the heights of the Championship, the demand for tickets in Burton simply doesn’t justify an extension and more so the investment it would take to complete the job. Pride Park Stadium sits within Pride Park itself on the outskirts of Derby city centre. Derby County moved to the stadium upon its completion in 1997 having previously played at the Baseball Ground. As well as being the home of the Rams, Pride Park has hosted two international matches and was the venue of the 2009 Women’s FA Cup final. Due to a sponsorship deal, the stadium was renamed as the iPro Stadium between 2013 and 2016 though given the cancellation of this contract the original name has been reinstated much to the delight of many Derby fans. The Queen opened the new stadium on July 18th, 1997 and the first game was played there on August 4th – a 1-0 friendly defeat to Italian outfit Sampdora. Over 27,000 attended Derby’s first competitive match at the stadium, a 1-0 win against Barnsley. Undersoil heating is deployed by Derby County beneath what is an all natural grass surface, something now uncommon among the top clubs in England. The playing area measures the standard 105 metres by 68 metres. The current capacity at Pride Park is 33,500 though this is rarely reached. Pride Park is made up of the West Stand – the largest area on more than one tier and running along the length of the field, the East Stand opposite and the South and North Stands at either end of the pitch. The north east and south east corners are filled in on lower levels, while the south west corner is larger. The north west corner is equally large but contains mostly corporate guests. With a standard allocation of around 2,700 tickets, away fans are housed in the corner of the East Stand and the South Stand. The stands are modern and offer unrestricted views of the action while the hospitality is generally greeted with favour by opposing supporters. 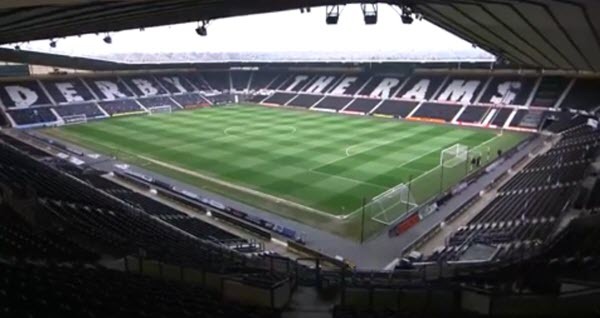 A typical adult single ticket for a Championship match at Derby County tends to be £15 – £33, though as always concessions are available all round the stadium for young fans and pensioners as well as disabled supporters receiving large discounts. Packages can be purchased game by game in either the Dave Mackay Lounge or the Pedigree Suite. In the latter, prices tend to run from £105 to £145 per person plus VAT, though if you wish to visit the Dave Mackay Lounge you will need to contact the club. 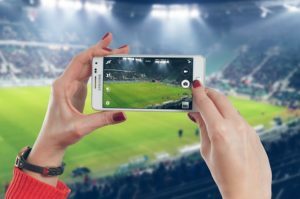 Packages include a buffet, complementary pre-match drinks, comfortable seating with a great view of the action, car parking and a matchday host. Pride Park Stadium is situated just over a mile from Derby’s city centre to the south east and is even closer to Derby train station. From the station the stadium is only a 15-minute walk away, though the walk from the city centre is around half an hour. Shuttle buses run from the city centre on matchdays and rail remains the best way to reach the ground if coming to see a game although for non matchdays plenty of parking is available. Not to be left behind by the dozens of clubs looking to modernise or expand, Derby County have tabled plans to extend Pride Park in order to house a new fan zone with bars and a food court. The extension would be to the East Stand and would be a two-storey development. 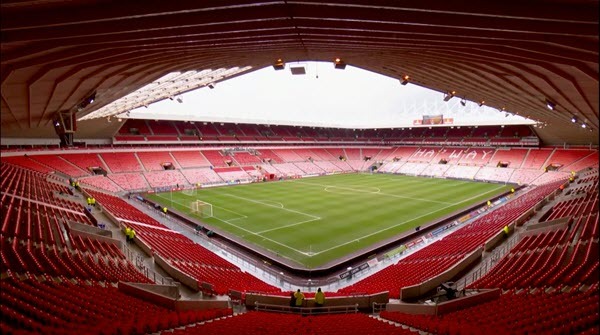 The Stadium of Light was opened in 1997 to replace Sunderland’s former Roker Park ground at a cost of £24million. At that time the Rokerites became the Black Cats and have played their football here ever since. 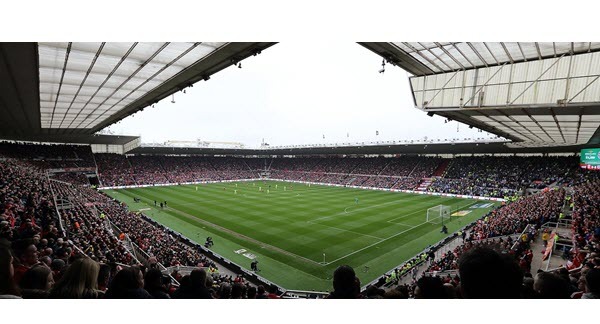 As well as Sunderland home games the stadium is used regularly for major music concerts with the record attendance for these being 54,259 (Rihanna, 2013). The playing surface at Sunderland is all natural grass and has the benefit of undersoil heating to aid growth and ensure games are not called off due to a frozen pitch. The bang on standard measurements of 105 metres by 68 metres are used for the pitch at the Stadium of Light. For football games, 48,700 people can fit into the stadium and for now this will not be extended. The stands are basically split into North, South, East and West with the North upper tier featuring away fans and being linked to the West and the upper Premier Enclosure by the north-west corner. The North and West Stands are the biggest in the stadium with the other two being single tiered. Visiting fans at the Stadium of Light are usually situated in the upper section of the North Stand, a change from years gone by when they were housed at the opposite end of the ground. The typical allocation for league games is 3,000 but this can be up to 9,000 for cup games. The very highest seats can suffer from restricted views with negative feedback having been drawn from some fans, though the atmosphere is good when the ground is full but sadly those days seem to be gone for now. 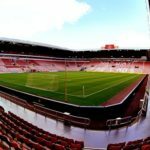 Single adult ticket prices for a typical Championship match at Sunderland are £25 – £30 with premium seating offered up at £50. Given the way the club have fallen, we can’t help feeling this pricing should have been reviewed. Heavy discounts are of course on offer for senior supports, junior fans and the disabled. Packages are offered in various parts of the ground, the James Herriot Suite, Riverview Brasserie, Exective Boxes, Montgomery Suite, Quinn’s Sports Bar and Black Cats Bar all options. Those wishing to book to watch the game in style should contact the club directly for seasonal or match-by-match prices. The main train station in Sunderland is served directly by Middlesbrough and Newcastle with the walk from there just about 20 minutes to the stadium. The more common way to access the club though is by Metro, the stadium being equidistant from both St Peters station and Stadium of Light station. The walk is only around 10 minutes in each direction. Buses from the city centre serve the stadium area too while drivers can take the A19, turning off onto the A1231 towards Sunderland and then looking out for Stadium of Light signs on the road. 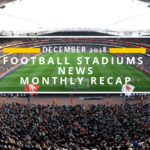 Most (former) Premier League clubs had plans in place to extend and modernise their stadia but in Sunderland’s case all plans are on the backburner with crowds dwindling. 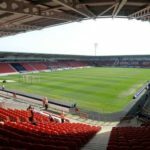 Despite a large and vociferous overall support, gates are down massively since the club’s relegation from the top division in 2017 and with League One looking a real possibility and crippling debts hanging over the club it will be a long, long time before we see any redevelopment of Sunderland taking place. The Den, or The New Den as it was known at first, was built following the recommendations of the Taylor Report back in 1992/93 and stands only a quarter of a mile from the Old Den. Millwall played their last game at the old ground on May 8th 1993 having been there for 83 years. £16million was spent on the New Den which was opened on August 4th 1993 in advance of a friendly against Sporting Lisbon, a game the home side lost 2-1. 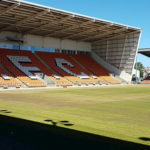 Even the New Den is now in danger following the possibility of a compulsory purchase order being enforced as part of the regeneration of the area. 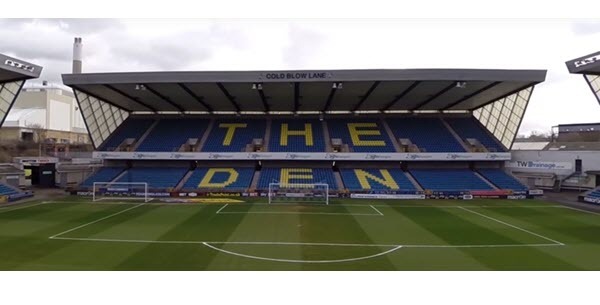 Millwall have said that the loss of land near The Den could mean the Lions being forced to move from an area that has been the club’s home for 107 years. Undersoil heating has been installed at The Den and means matches are not called off these days purely because of a frozen pitch, while the surface itself is made up of fibresand grass and is 106 metres by 68 metres – standard for a club at this level. Over 19,700 fans can occupy The Den though that number of seats is not often needed at the ground. 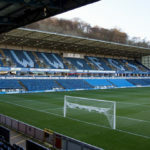 The North Stand is for visiting supporters only and sits behind one of the goals, while opposite is the Cold Blow Lane Stand. Running along the length of the pitch are the Dockers Stand to the east and the Barry Kitchener Stand to the west. None of the corners are filled at The Den. Millwall still suffers from its hooligan legacy, though thankfully these days away fans are treated very differently given the large police presence and the area is almost completely safe. The away section can be as big as 4,000 strong for league games and means they basically have the North Stand all to themselves with views unrestricted and the atmosphere still good, though obviously not as vociferous as it used to be back in the 80’s. Price bands don’t move too much at The Den making it easy for ticket buyers to know what to expect. Typical single adult prices for a Championship match range from £25 – £30 though concessions are offered for seniors and the disabled. Under-12’s get into the ground for only £6/£7. Hospitality boxes are made available at The Den, priced at £575 plus VAT for ten people. On a single ticket basis, the VIP Matchday Experence can be purchased for £89 plus VAT and entitles each guest to the sponsor’s lounge, a stadium tour, a three-course meal, a private bar and other features. Situated in Bermondsey, south-east London, The Den is only four miles from the City of London and is served by the South Bermondsey train station. Trains to there connect from London Bridge station with a journey time of only 4 minutes, running up to five times an hour. 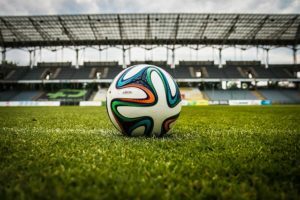 A 15-minute walk from the stadium is Surrey Quays overground station on the East London line while underground there is the Canada Water station on the Jubilee Line is a 25-minute walk to the ground. Several bus routes serve the stadium while driving to The Den is not recommended with limited parking and plenty of traffic, especially on matchdays. Given the uncertainty surrounding the future of The Den, no plans exist to redevelop, modernise or extend the stadium in the near future. Villa Park is one of the most recognisable football stadiums in England. It was completed in 1897 and has been the home to the Villans ever since. Having previously played at Wellington Road, Aston Villa moved into what was the Aston Lower Grounds in 1897 and over the subsequent 121 years have made plenty of changes to the site. The club as of now has planning permission to redevelop it’s North Stand which will increase capacity to 50,000, much more in keeping with modern Premier League stadia should their long term future be in the top flight. Until they were all played at Wembley, Villa Park was a traditional FA Cup semi-final host for many years and has also hosted the Community Shield and League Cup final. The pitch at Villa park measures the standard 105 metres by 68 metres and is made up of both synthetic fibres and natural turf, as is the modern way. Undersoil heating is utilised by the club to ensure games are not called off due to cold weather. Currently just under 42,700 fans can cram into Villa Park, though this may once again increase in the future should the club get back to the Premier League and stay there. The famous Holte End stands behind one of the goals, opposite to the North Stand. To the east of that is the Doug Ellis Stand while on the opposite side is the Trinity Road Stand. Away supporters generally sit in the Doug Ellis Stand over on the east side of the ground with an allocation of around 3,000 generally. When the full allocation is in use, away fans are housed in two tiers of the stand above and below corporate hospitality though for smaller visiting congregations only the upper section is used. This becomes a problem in some cases as fans have fed back that the upper concourse is tighter and sees bigger queues for drinks etc than the lower tier. Single adult matchday tickets generally start from £20 at Villa Park for a Championship match and range up to £33, fairly competitive for a club of this size. Concessions are always offered at the ground also for disabled, older and younger supporters as well as family packages for around £55. Hospitality guests can book season-long package deals, though match-by-match entries are also allowed with the Doug Ellis Boxes, the 82 Lounge and Restaurant, the Heineken Lounge, Trinty Executive Boxes and the Director’s Club all offering packages at varying prices depending on what it ordered and what game is being played. 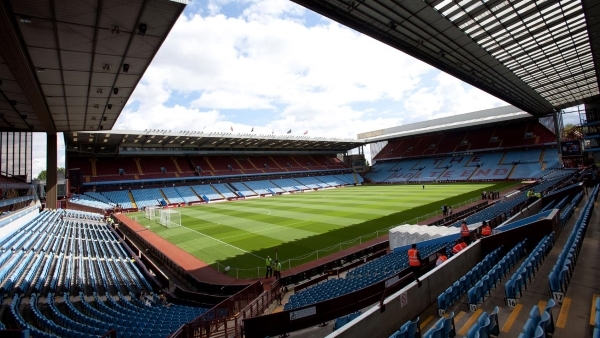 Villa Park stands in the north of Birmingham, around 2½ miles from the city centre and can be accessed by numerous bus routes. By car you can take the M6 motorway, leaving at junction 6 before following signs for the A38 and then A5127 before seeing signs which will take you to Villa Park. Public transport is usually best on matchdays however with the stadium reachable by train via Aston or Witton stations, both of which connect to Birmingham New Street station in the city. Aston is a 15-minute walk from the ground while Witton is only 5 minutes away on foot. Villa’s owner has held meetings with Birmingham City council and hopes to begin work on modernising Villa Park in 2018, especially the North Stand, with the plans meaning an extension to capacity making the overall around 50,000.